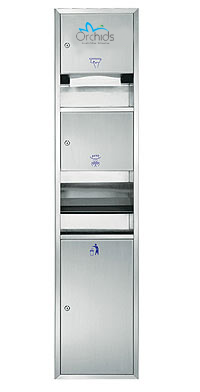 A Multi-function Recess Panel has paper dispenser, hand dryer and waste container in one Stainless Steel unit so it can be used for multiple purposes. It also contains waste container section to the recess panel for user convenience. Hypuz is a reputed supplier, manufacturer and wholesaler of Multi-function Recessed Panel across Mumbai. 22 gauge Satin Finish Stainless Steel. Paper towel bin can hold 800 C-Fold or multi-Fold Paper towels without special adapter.